On Friday 28 October 2011, FCC’s main sports ground was the venue for the Government of Punjab’s on-going campaign for collecting a database of potential blood donors. The camp was organized under the auspices of FCC’s Red Crescent Youth Group. A team from the GoPb’s Social Welfare and Health Departments collected the data of potential blood donors by doing blood grouping on the spot, free of cost. Mr Nadeem Hassan Asif, Additional Chief Secretary GoPbPunjab, along with Prof Dr Hamid Saeed, Registrar FCC, visited the camp and appreciated the efforts of the Red Crescent Youth Group. Mr Nadeem Asif also briefed the students about the importance and functioning of the Chief Minister’s “Punjab Blood Line” campaign. 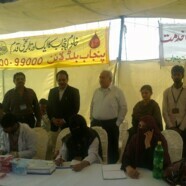 Around 400 students registered as potential blood donors on the first day of the camp. The camp will continue on Monday 31 October 2011.